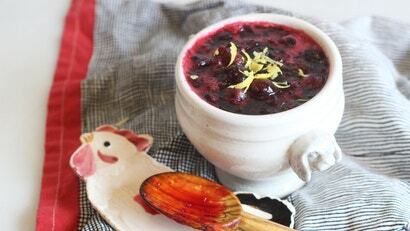 Like every single component of Christmas dinner, cranberry sauce inspires a lot of feelings. There are can purists — “We need the ridges!” — and there are homemade enthusiasts. Then there are those who like to play around with the genre, infuriating both camps. I bet you can guess which category I fall into. If you’re going to play around with only one component of your Christmas dinner, cranberry sauce is your best bet, simply because it is so easy and quick to make. Seeing as there is no rule that says a homemade sauce can’t sit next to a perfect cylinder of gel, you should feel emboldened to make as many varieties as you want. Heck, you can make a veritable sampler of sauce, and one of those sauces should contain blueberries. Combine everything in a sauce pan and bring to a boil. Reduce the heat, and let everyone hang out and simmer until the cranberries have come completely undone, and the sauce has thickened. 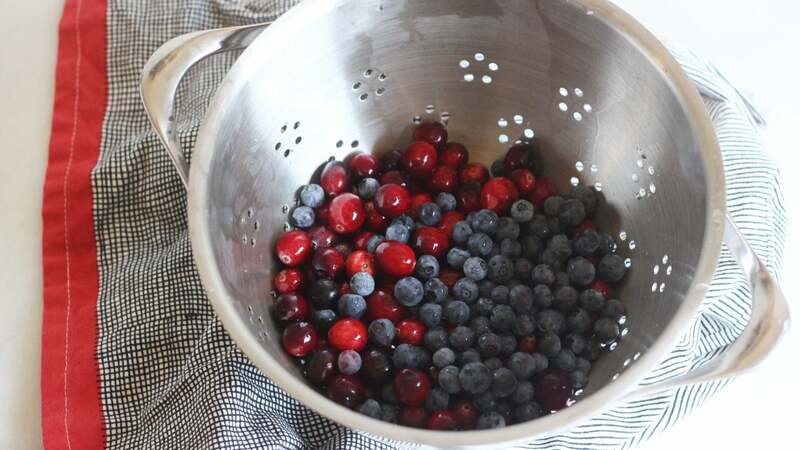 Remove the large strips of zest, transfer to a bowl, and let cool completely before serving.